After 9 years in DC, we are still finding fun things to do. 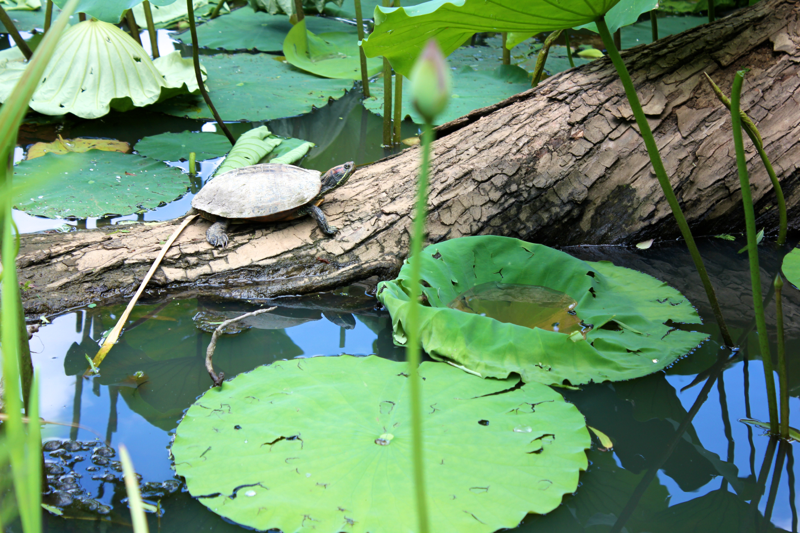 The Kenilworth Aquatic Gardens are well worth a visit and serve as another reminder of how easy it is to enjoy nature within the city limits. We took Stella over there on a surprisingly mild summer day to walk around the expansive marshland, admire the lily pads, and sniff out some wildlife. She wasted no time making herself at home- rolling around in the mud and sporting a dirty streak on her face. I was surprised by the grand scale of the lily pads. Plenty of them were taller than I was, and the ones resting on the water’s surface were large enough to serve as a pool float. 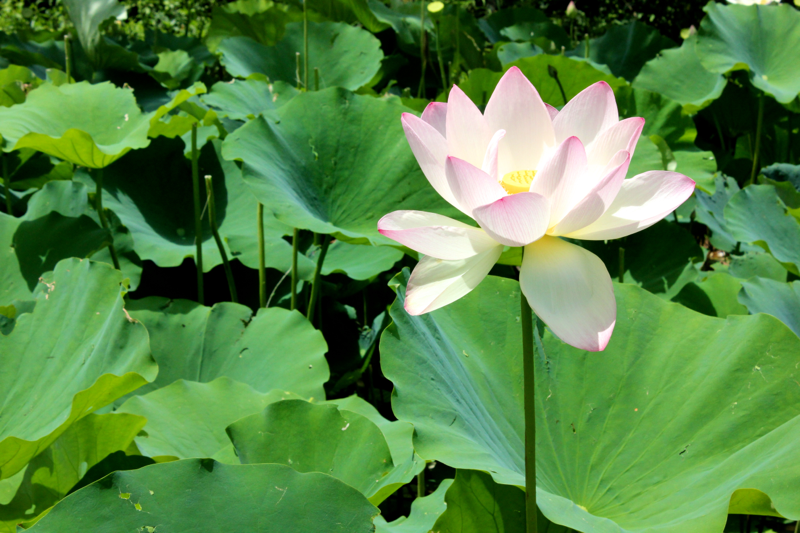 The lotus flowers were stunning. So many of them were open and in bloom. Newly opened buds were hot pink, and ones that had been in bloom for a while were more white. The flowers were also gigantic and had big, yellow seed pods right in their centers. The flowers swayed happily in the breeze, but I didn’t notice any flowery smell coming from them. 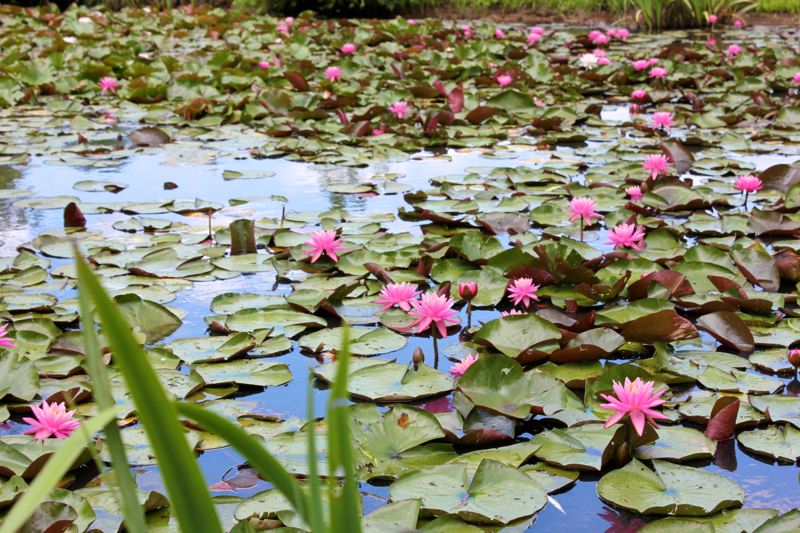 There was a wide variety of lily pads at the gardens. There were these smaller, hot pink ones as well as some white ones. The taller flowers were definitely our favorites though. 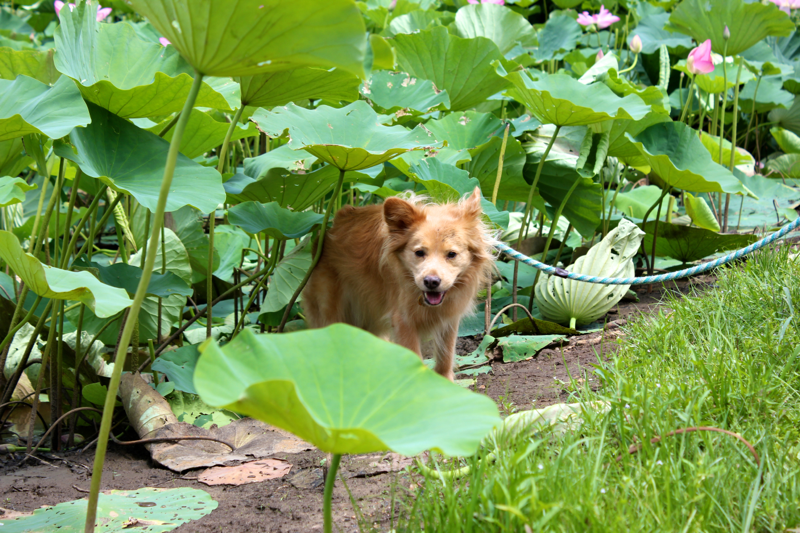 Stella was curious about all of the new things she was encountering and spotted a severed lotus flower floating in the water. She was very suspicious of it, so David fished it out for her to inspect more closely. 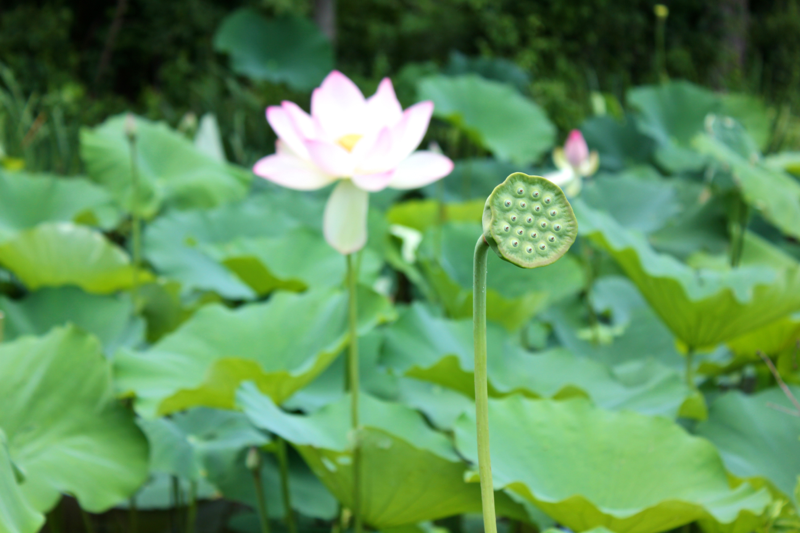 David was more incredulous about the lotus seed pods. The bright yellow ones seemed waxy and fake, and the green ones that lost their leaves appeared bug-like. On a related note, lotus roots are edible, but I’ve never cooked with one. 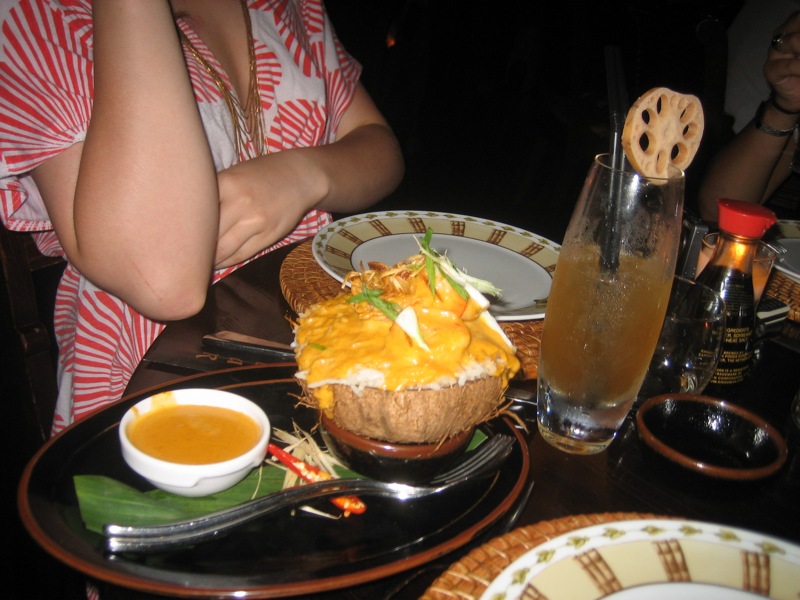 Here’s a picture of one garnishing a cocktail (at Buddha Bar on my last night living in Paris…sniff). 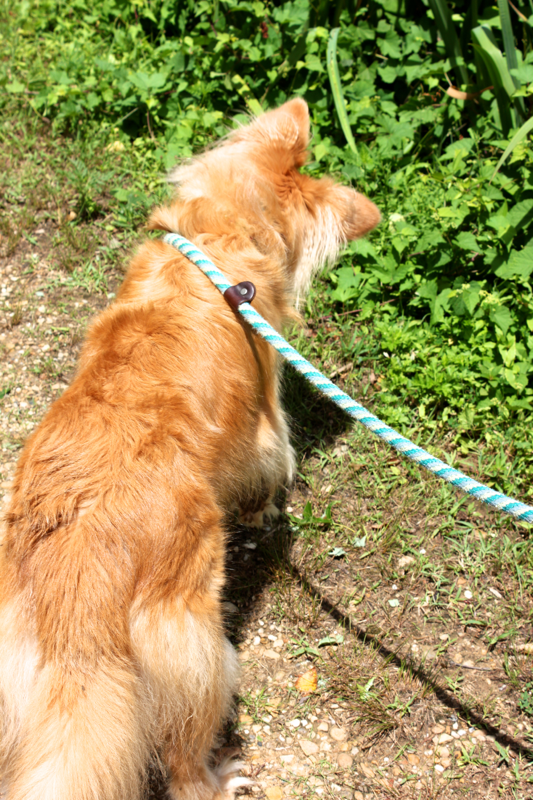 Stella encountered her first frogs on this visit, but they were only heard and not seen. Her ears did not know what to make of those sounds, and I thought she was going to twist her head right off. 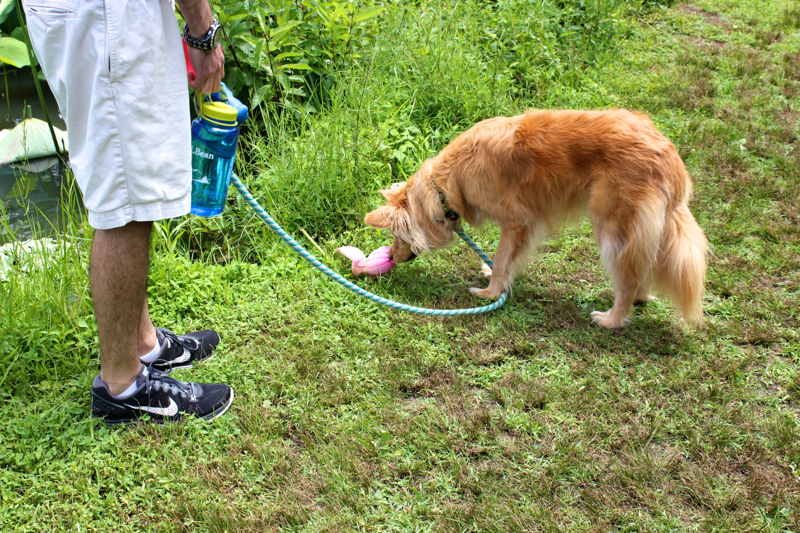 Stella also sniffed out her first turtle! Not this one though- it was smaller and nestled in the grass. She circled it cautiously, jumping back like she was in imminent danger, until David stepped in to scoop up the turtle and set it down closer to the water for an easy escape. It scurried away quickly (for a turtle) and fell down a hole. I always enjoy everything you write about. I wish you would write a book. It would be a best seller. You have a special talent in many things. I love reading about Stella, your life in D.C. and my favorite grandson-in-law, David (with the beautiful eyes).